Coinbase’s CEO Brian Armstrong wrote an article about the current state and future of cryptocurrency. I’d like to address one point he made, the concept of an investment phase and utility phase in cryptocurrency. First, here is his article on Medium: Is Coinbase creating a centralized or decentralized financial system? (the centralized vs. decentralized argument is his focus, but he touches on another concept which is what I’ll focus on below). Onto my point: The idea I want to address is the idea that cryptocurrency isn’t yet at the stage it will be or was meant to be, a stage he calls the “utility stage,” a stage in which people are using decentralized technology (blockchain / smart contracts) and using crypto for peer-to-peer payments. 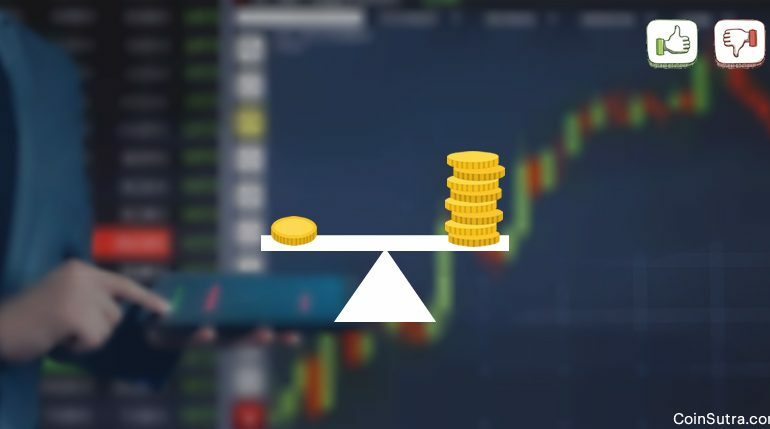 Instead, it is mostly in what he calls the “investment stage,” a stage in which people invest in tokens and speculate on centralized exchanges (where a blockchain is nothing more than a platform for hosting a token and a smart contract nothing more than a means for creating a token). Armstrong presents the idea that currently 90% of what is happening with crypto today is that it is being traded on centralized exchanges (i.e. used for making money; AKA “investments”). Meanwhile, the other 10% is decentralized peer-to-peer transactions and the utilization of the underlying tech (i.e. used for its original purpose; AKA “utility”). Adoption of cryptocurrency will happen in several phases. In the investment phase people speculate and try to make money on crypto. This is where 90% of activity is happening today, primarily via centralized exchanges. In the utility phase people begin using crypto as a payment network, transacting for real goods and services, interacting with dapps, etc. This is where about 10% of activity is happening today, primarily via decentralized (user controlled) wallets. In other words, the investment phase draws enough people in that a critical mass of people is reached to spark the utility phase, or come for the tool, stay for the network. The problem with that is, while the investment stage is fun, valid in its own right, and arguably even a necessary part of the evolution of crypto, it has little to do with the initial concept or purpose behind cryptocurrency… and instead looks an awful lot like its on-paper antithesis. Meanwhile, the 10%, the purpose and intent of crypto and its founders (like Satoshi), is often almost lost in the background somewhere behind the speculation. Of course, the good news is that Armstrong (one could argue correctly) predicts that we will transition towards a utility dominated future as adoption occurs over time. Still, in the here and now, there is a big disconnect between what crypto is supposed to be and what it actually is. In fact, to restate the above clearly before adding detail, one could argue that the current investment stage is in some ways the antithesis of everything cryptocurrency was supposed to be in the first place (AKA “Satoshi’s vision”). Satoshi’s actual vision was, and correct me if I’m misreading the white paper and his early forum posts, a peer-to-peer decentralized and trustless digital payments system that could protect the people of the world from the shenanigans of states, banks, and brokers that lead to the 2007 – 2009 global financial crisis. The system in practice constantly relies on centralized entities from the developers who pre-mine, to the big miners who mine, to the exchanges that cryptos trade on. There is a problem of centralization. Arguably no market in the history of humankind has produced as large and nasty and frequent of economic bubbles than cryptocurrency. There is a problem of global financial crises(specifically ones that hurt the plebs and benefit speculators and the few and specifically those who run centralized systems). The fluctuations in price, if nothing else, makes for a lackluster currency (as although we all love the random deflation when it occurs, the constant and rapid inflation and fluctuations are real problems). There is a problem of utility, especially in terms of the use-value and usage of tokens in peer-to-peer payments. Maybe it makes sense on some levels that the stage that leads to an end goal contains so many opposites (that a thesis on-paper, itself a reaction AKA antithesis of sorts, led to an antithesis that looks like what the original thesis was reacting to, and that eventually all this conflict will resolve into a synthesis that provides an answer to the original thesis), but that is one existential road map (an odd, but clearly not historically uncommon, form of peoples’ revolution). Anyway, there is the theory of how things maybe could have and should have been different, and then there is realism. The reality is we are on a path that Armstrong believes paves the way for a future in which centralization and decentralization and investment and utility naturally meld together as new adoption occurs and crypto evolves. Frankly, for all the collateral damage and irony, that makes sense and hints at a bright future and a fun-for-what-it-is ride along the way. Of course, until we get to that future, we should expect volatility, bubbles, speculative finance, and a degree of centralization. Given that, it is likely that when we get to utility, someone will have to step up and create a 3.0 version of tokens and technology that circumvents that intense centralization and consolidation of wealth happening right now. If not, the end result will be just another widget in the long line of widgets that already are consolidated and centralized. NOTE: For some people, namely for speculators and investors, the volatility is the best part. The reality is I enjoy that part myself (check out our robust section on cryptocurrency investing and trading). The fact that a token can be bought cheap in an ICO, is then pumped, and then you can parachute out at the right moment to 10x+ your investment is the main draw of crypto for many (and let’s not lie, it is getting new users in the door, which sets us up for the next stage in theory). I don’t deny that joy in that, and I don’t deny the logic in how things might play out because of it, my sole point above is that this investment stage is common. Speculative finance was a hallmark of the old system. It created antitheses like Satoshi and Assange, it was clearly part of the problem that crypto said it was trying to solve. If crypto stopped here, then I’d say it was like building a casino to stop casinos. My point being, such a thing is ironic. My other point being, I like Armstrong’s idea as to why we won’t get stuck like glue in the current absurdity and may eventually realize parts of the original vision and/or use the underlying tech for something other than creating tokens to speculate on.